When you are differently-abled, going to the bathroom can be a pain in the… well? If you are partnered with a service dog, it can make the process even trickier until you get a nice routine down. Likely, one of the biggest issues for all of us is ACCESS. In the United States, public restrooms are required to be handicap accessible. For restrooms that have multiple stalls, the number of required handicap accessible stalls depends on the total number of stalls in that location. All must have at least one, according to the ADA. Milo, my current service dog from Fidos For Freedom, Inc., is a very big boy. A German sheprador, Milo is 80 lbs. of helpful tail wags. Between my wobbles, cane, and big boy helper, I require some room to use the bathroom safely. I will be honest with you, I use to get aggravated if waiting for a handicap stall, only for the person to exit and they looked perfectly fine to ME. A student leader in the Anne Arundel Community College‘s SODA club (Students Out to Destroy Assumptions), reminded me during a particular scathing belly-ache rant, that not all disabilities are visible. I think it is great when student leaders can challenge long-time advocates, don’t you? Kudos. the handicap stall. I stood there (with legs crossed) and waited for the person to exit. I even took out my phone to appear less desperate. Milo’s ears perked up (indicating a toilet was being flushed), and I stepped to the side about a foot so that the person could exit safely. I didn’t bat an eye when the person who came out “appeared perfectly abled”. It is no longer my default judgment to assume the person didn’t need the larger size, rails, and access to the stall. I’m pretty sure my mouth dropped open. I counted to ten and purposefully and deliberately maintained the position of my cane on the floor where it belonged, and said, “Yeah, there’s always a chance someone will need it who is waiting for the accessible stall!” I smiled (honestly! I did!) and scooted around her with Milo, closed and locked the door. I have never had proof staring me in the face before. 24 hours later I am still processing it. My new default is a good one though. We cannot judge who uses a handicap stall even if there are other stalls empty. The handicap stall might be the only one empty when they came into the bathroom. Perhaps the other toilets are “nasty” or out of order. Perhaps it is a parent with a small child to assist. So… put the cane down; no clobbering innocent folks relieving their own needs. That wasn’t nearly as satisfying as busting someone up ‘side the head. I remind myself that I can be an unfeeling jerk and clueless twit about things I don’t understand. If we all learn to put ourselves in someone else’s shoes, the world would be more respectful and kind. The first time I heard Rachel Platten’s “Fight Song“, it was actually sung by a different young woman who had faced a life threatening illness and “won”. You can find Calysta Bevier’s audition for “America’s Got Talent” HERE. Yesterday, Fidos For Freedom, Inc. held its annual certification day. Service dog and hearing dog teams re-certify their skills and clients take a written exam. Milo and I passed with flying colors. While there, I was able to catch up with other teams. 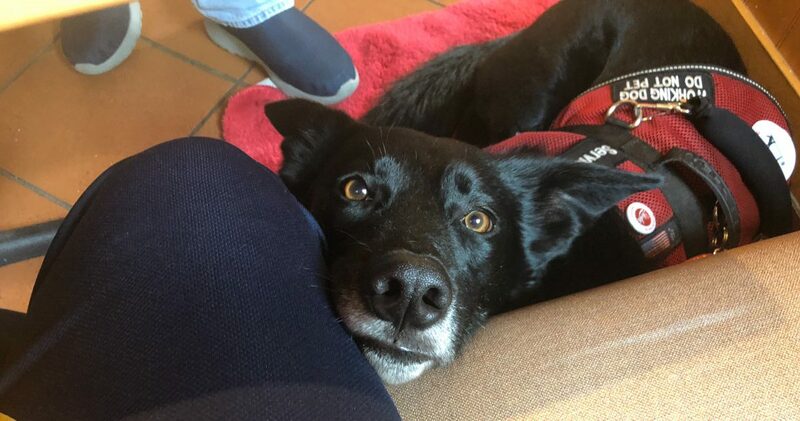 I overheard various teams refer to their service dog as their “partner in crime”, “wing man”, “partner”, “side kick”, “best friend”, and “best buddy”. I’m a believer in the power of the human spirit. I have also seen many people who are differently-abled, dig deep and find the wherewithal to “just keep swimming” (as our friend Dory from Disney’s “Finding Nemo” taught us). At certification day, there is understandably some waiting in line. In an “all volunteer” organization, it takes a village of caring and committed volunteers to make certification day happen. However, clients do have to spend some time waiting for the next station to open up so that they can be tested on those skills. While waiting, I people watch. I’m easily caught up in emotion and found myself getting choked up looking around at various teams performing like super heroes. Can these individuals FIGHT without a service dog at their sides? Yes. I have no doubt. However, having a service dog makes each and every day a little easier. It’s more than the skilled tasks they do, y’all! Milo retrieves dozen of items I drop each day. He is my alarm clock. He opens and closes the dishwasher, refrigerator, and gets clothes out of the dryer for me. He braces when I stand from a sitting position. He walks along side me and is only a touch away. Yet, the biggest benefit Milo brings to my life is psychological and emotional strength. Can I fight alone? Yes. But I don’t have to do so. Milo is with me 24/7. If I’m having a bad balance day, I go to work anyway knowing he’s got my back. If I’m dreading a large meeting, knowing in advance I will have trouble hearing, he provides the courage I need to do what needs to be done. I consider myself an advocate and “assumption destroyer”. However, Milo makes me a super hero. I think service dog partners forget those “under the radar” strengths our service dogs provide for us. On annual certification days, I am often reminded. Observing these teams and the trainers who coach/love them, brings these hidden benefits into startling clarity for me. We can count on other caring human beings to help and support us as needed. However, it is only a service dog partner that can be there ALWAYS. I want to leave you with the lyrics and original video of “Fight Song”. 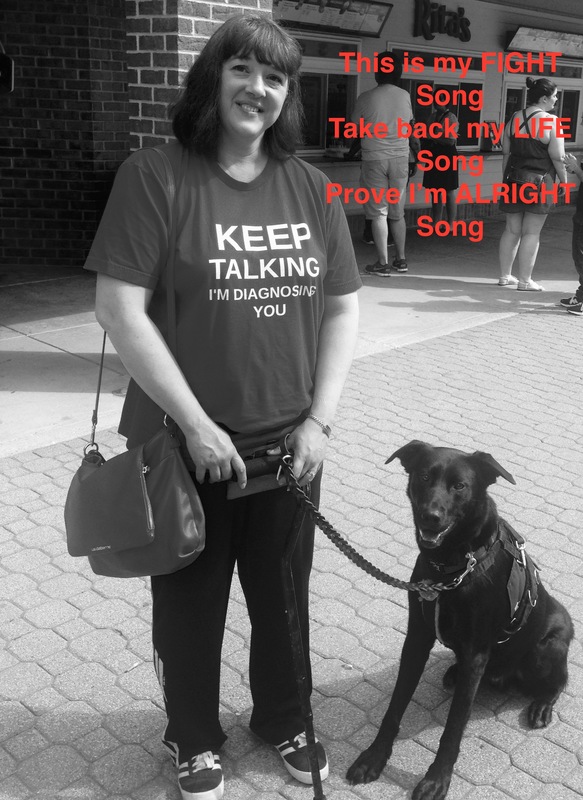 I also am not ashamed to acknowledge that I found my own fight song with the support of a service dog. For me… it made the difference.